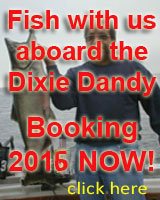 You travel for several hours, check into a motel, perhaps grab a bite to eat, and then hit the hay in anticipation of an early morning trout and salmon trip aboard the Dixie Dandy. It is probably still dark when you show up at the marina, full of enthusiasm and excited about the upcoming day on the water. As you approach the boat, there I stand ready to curb your excitement with the report the weather is bad, the winds are too highâ€™ and we probably will not be able to fish this morning. Trust me when I say that I really dislike being the messenger of bad news, however, a fish, no fish determination will always be based on safety first, then the ability to catch fish in current weather conditions, and finally will the existing conditions get worse or let up as the day rolls on. Generally we will wait out the weather for a time to try and get the trip completed if at all possible. Sometimes the winds subside and we can venture out, however often times the â€œblowâ€� lasts for the entire day. Try as we might, we just cannot provide you with the trip you deserve. When you book for two days this gives us some flexibility in that if we do not fish one day we can fish the next. Sometimes when we are fishing on day one and we learn that the next dayâ€™s weather patterns will be prohibitive, we can stay out longer if you desire. Simply put a two day trip gives us some flexibility. 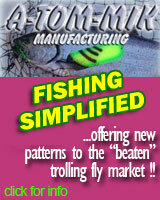 I realize that not everyone can do this so we really try very hard to fish if it is possible. On some days, whether we fish or not is totally up to you. These are the days when the boat can definitely handle the seas; however our customers for the day may not be up to toughing out the rough conditions. Generally a fish no fish decision is up to the Captain. If the captain says we will fish then we will fish. I do not assume the role of dictator when weather is â€œiffyâ€�. I will explain what conditions on the open lake will be like , and sometimes venture out to open water to let you decide if you want to fish or not. 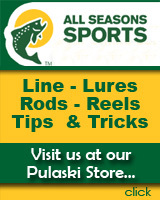 You see, if want you to become a valued customer, and fishing has to be an enjoyable experience. After all, we can fish another day. That is how I run my business and it has proven to be an acceptable practice. I have built my business based on customers who return year in year out. If I take you out in heavy seas, where you get bounced around until the dreaded sea sick felling grabs you in the belly, well I donâ€™t expect you will be back. Anyhow thatâ€™s how I do it! Seems to work for me. Use the form below to send a private email message to the author. A friend (sender above) has sent you this email and thought you should check out this CaptainExperience.composting.